This safety instruction is of great importance and a prerequisite for entering and independent work in building 88 (B.U.F.F.). This building is different from other buildings on the campus Berlin-Buch due to its MR scanners. The MR scanners have potential dangers associated with them, which you must be aware of! This safety instruction is based on reports by the rays Commission (SSC) of the Federal Ministry for the Environment, Nature Conservation and Nuclear Safety and according to § 22 of the Medical Devices Act. 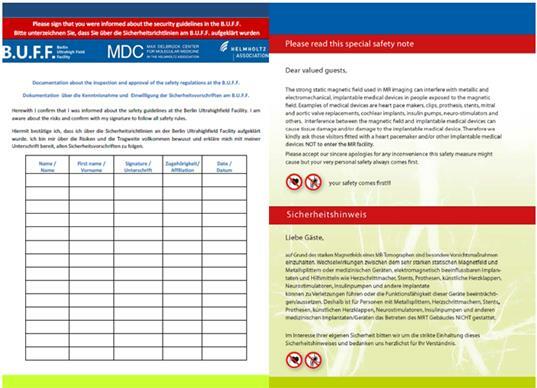 This safety instruction is available as a PDF for download. The sections marked with an ‘S’ and ‘P’ are only necessary for those who work in the S1 area and the laboratory (S) or for those working in a clinical study with volunteers (P). 1. Specific risk factors at B.U.F.F. The magnets are always switched on! Entering the B.U.F.F. 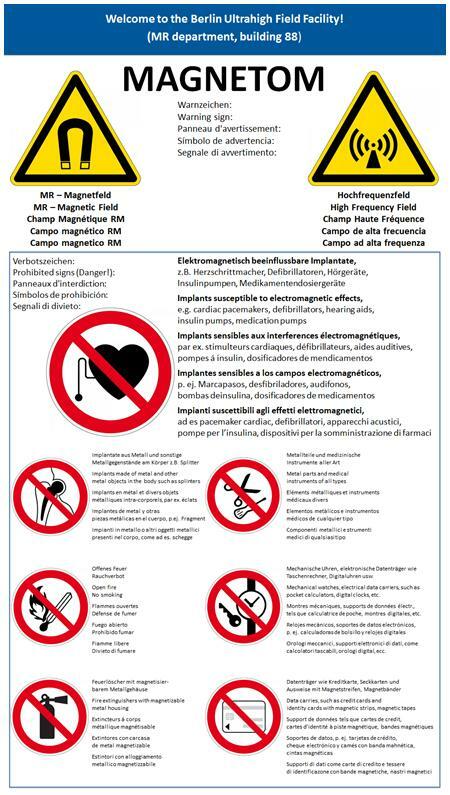 is prohibited for persons with heart pacemakers, insulin pumps or other implants which can be influenced electromagnetically! 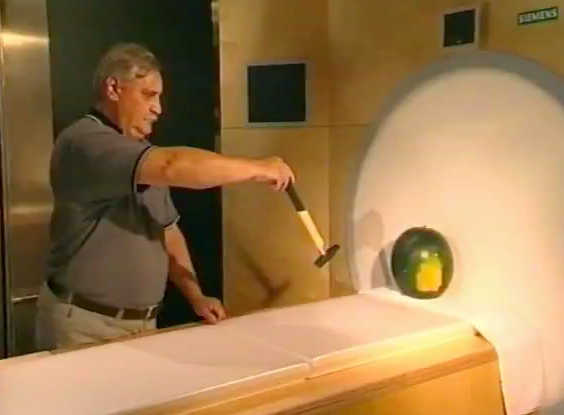 The magnetic field is not limited to the MR room, but is present in the entire MRI building. Upon entering the B.U.F.F. you are exposed to the magnetic field. The whole building is thus a danger zone (see yellow line). People with pacemakers, insulin pumps or other implants which can be influenced electromagnetically may not enter the building, as standing within the magnetic field in the building can be life-threatening. Particularly the crossing of the 5 Gauss line for people affected is dangerous. In the following floor plan the three danger zones are shown. Due to the hazards of the scanner with it, the MRI building access must be protected. The warning signs at the entrances point to these dangers. The signs should also have to point out that for individuals with metal implants, mechanical watches, keys, credit cards or other metal parts may not be allowed to enter the MR rooms, even though they are allowed to enter the building. 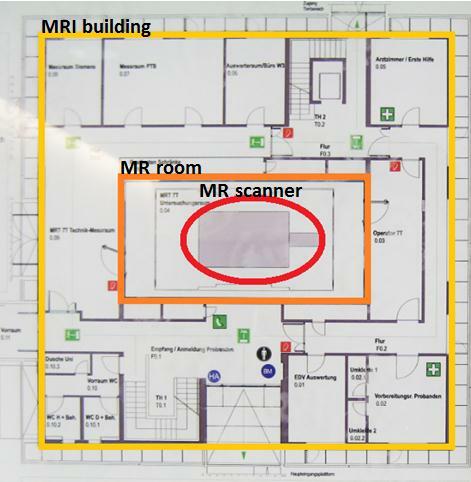 At the entrances, visitors are informed about the risks and dangers of the MR scanner. Visitors must provide written consent and understanding of safety instructions in order for admittance to the B.U.F.F. to be granted. Very strong magnetic field, which rapidly increases with decreasing distance from the MR scanner. A strong magnetic force can act on metallic objects. Entering the MR room is prohibited for pregnant women and people with prosthetics (legs, artificial hip joints)! You are not allowed to bring metallic objects (like tools, scalpels, hair clips, and scissors) into the MR room! The user of the MR scanner is responsible for volunteers, staff and material! 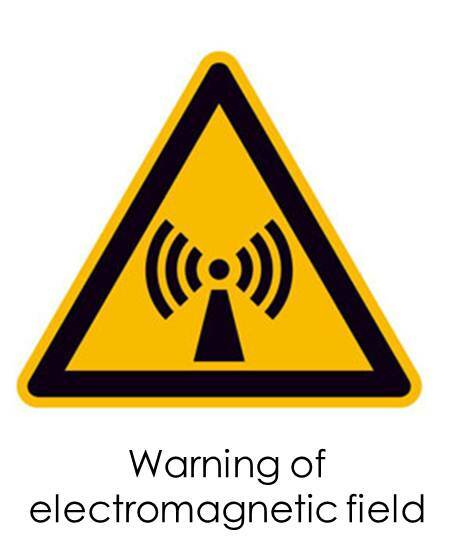 Magnetic fields cannot be seen or heard, and if you can "feel it", it is usually too late! The MR scanner is a high-tech tool and requires intense concentration. You as a potential user bear full responsibility for the volunteer or subject, the staff and the materials. The Magnetic fields cannot be seen, heard, tasted, and if you can feel it, it is (usually) too late! 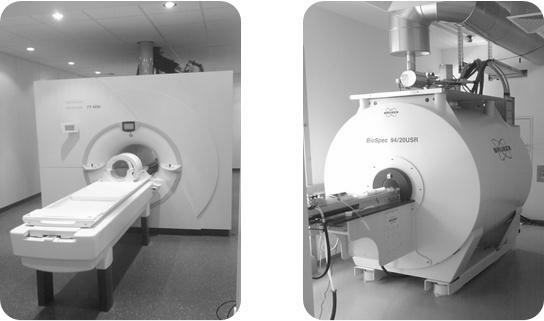 The following pictures show the scanner for human volunteers (on the left side) and the animal scanner (on the right side). 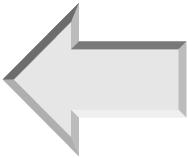 The magnetic field of a scanner is a static magnetic and it is always there although in standby or the console is switched off. 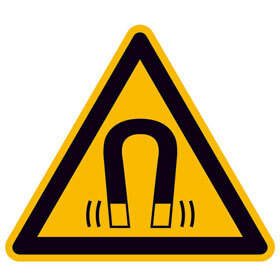 The following symbol warns about magnetic fields. The magnetic attraction to ferromagnetic objects generated by the scanners is very high. These attractive forces are getting stronger with decreasing distance to the magnet. 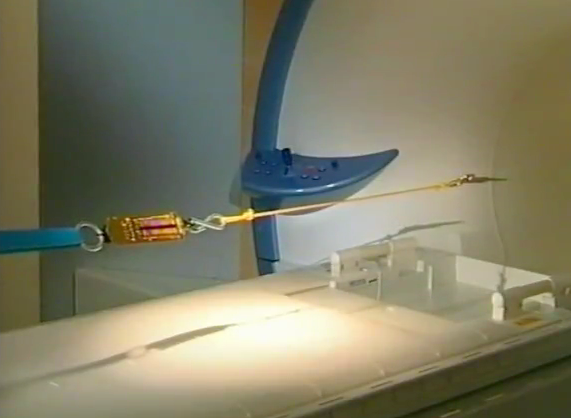 Objects such as scissors or a gas cylinder can turn into projectiles through this magnetic pull of the scanner. Therefore, you may bring in NO metallic objects into the scanner room. Warnings and markings must always be observed! Only objects and devices that are marked with the green MR icon (left) present no danger for staff and equipment when operating in the MR room and are allowed to be brought into the MR room. The yellow MR icon (middle) indicates things that are only MR safe in a limited fashion. There is always specified safety distances must be adhered to from the magnet! The red MR icon (right) marks objects which are strictly prohibited from being in the MR room! 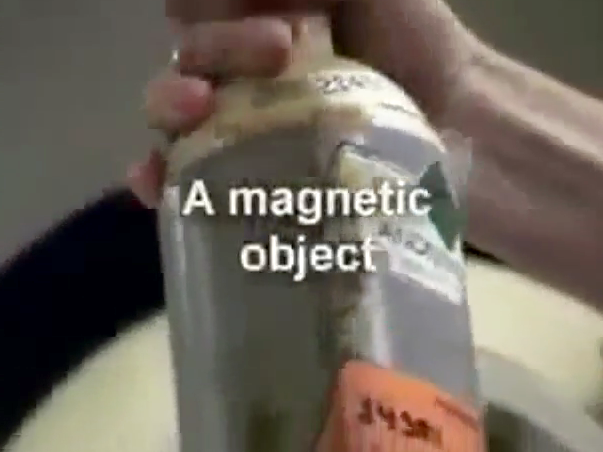 In the following video you can see how a hammer and a pair of scissors in a magnetic field turn into dangerous projectiles. The melon symbolizes the head of a volunteer. This video shows the force with which a pair of scissors is attracted to the magnets with different field strengths. The static magnetic field involves, as you have seen in the videos, a variety of dangers to which you should always keep in mind when you enter the MR room. Volunteers must always wear the dedicated volunteer clothing. No one except for the volunteer is allowed to stay in the MR room during measurements. People who are in the scanner must wear ear protection! The volunteer must be advised to close his / her eyes when the positioning laser is being used. Never place ECG and coil cables on bare skin and never cross them! The gradient fields, which can induce stimulation of peripheral nerves and muscles in the body, are a further source of danger. A particularly high risk exists in patients with implanted wires in anatomically / functionally sensitive regions, and therefore they cannot be admitted as test persons. During the normal use of an approved device for the investigation no harmful effects on humans are expected. 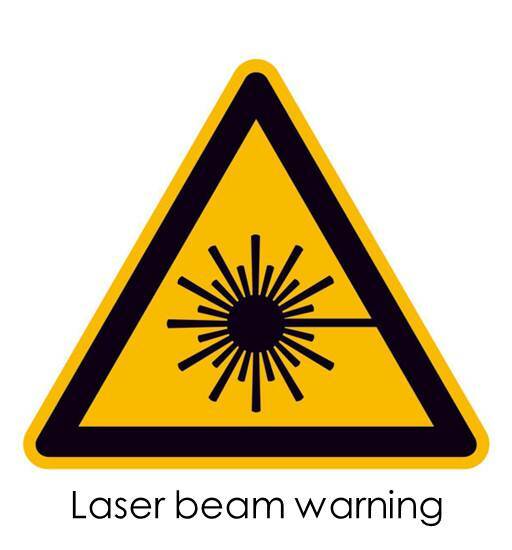 BUT: Risks for staff, patients or test persons still exist by the static magnetic fields, the gradient fields, the high-frequency pulses, the incorrect positioning of the volunteer and by the laser light localizer. The acoustic load in the MR scanner is up to 110 dB. 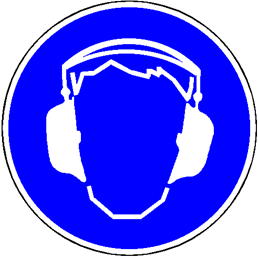 Volunteers and persons, who reside in the scanner room during a measurement, therefore should always wear ear protection. Note: Typical acoustic MR noise of the scanner is partly to hear outside of the building and should not be confused with alarms! High-frequency pulses are a source of risk as well. High-frequency electromagnetic waves of the system lead to thermal effects in body tissues. These thermal effects can cause internal burns. When positioning the volunteer you should always keep in mind that direct contact between the volunteer’s tissue and inner bore of the magnet is not allowed. Loops of volunteer tissue (left) and the overlapping of the extremities in the scanner are not allowed as well because such positioning can lead to burns. Therefore volunteers always have to wear special clothes. The coil is positioned in the magnetic center using the laser light localizer. Patients are always asked to close their eyes, because of the risk of suffering retinal damage. In the rare event of liquid helium being refilled into an MR scanner be aware that larger amounts of helium may be released by accident. Helium bares the risk of suffocation as it displaces the room air and oxygen! If you see someone lying on the floor in the MR room be aware and do not enter the room unless you are wearing an oxygen mask! The magnets are cooled by liquid helium. In case of contact with helium there is a danger to freezer burn. You should always wear protective clothes when working with liquid helium! In high concentrations helium may create a danger of suffocation, since helium displaces oxygen. Therefore you should never bend into a container of helium. Always make sure that the ventilation is working. There is no instrument for the measuring of oxygen content in the scanner room. 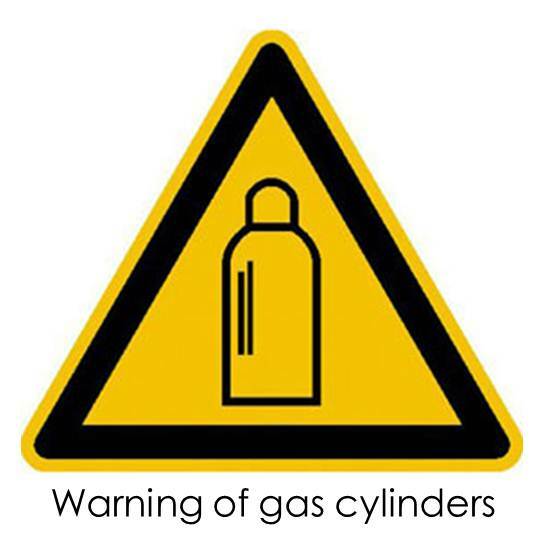 If you see someone lying next to a helium tank on the ground, then do not enter the room without an oxygen mask. The magnet is always switched on and is only allowed to be turned off in life-threatening situations for humans and during special maintenances! First, ALWAYS get people out of the MR room! Starting the emergency measures is ONLY allowed outside the MR room! Emergency staff and doctors are generally not allowed to enter the MR room! Defibrillators and oxygen bottles are prohibited in the MR room! The Siemens ECG unit can be brought into the MR room. Emergency situations always have to be reported to the safety officer. Only in life-threatening situations caused by the magnet you are allowed to activate the magnet emergency stop and the magnet quench. How to behave in case of a Quench you can find here. 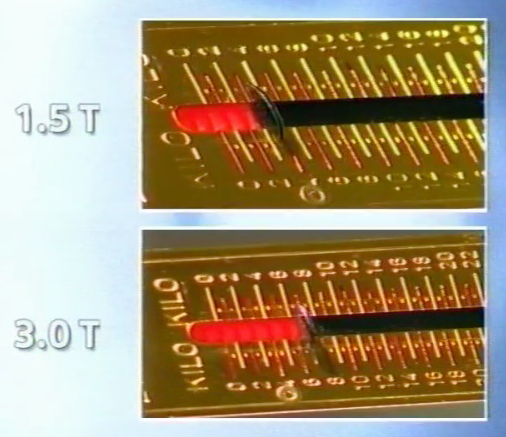 Pressing the magnet quench causes costs about more than 100.000€. While special servicing of the magnet you are allowed to switch off the magnet as well. After pressing the magnet quench all people should leave the MR room, because helium escapes (see 5. Dangers of helium)! These emergency facilities are located in the computer rooms of the scanners on each floor. Additionally, in threatening situations in the scanner room you can activate the electrical emergency stop! But you must be aware that the magnetic field is still present. First ALWAYS get exposed people out of the MR room! Starting the emergency measures is ONLY allowed outside the MR room! In an emergency first get exposed people out of the MR room! Starting the emergency measures is ONLY allowed outside the MR room! Defibrillators, oxygen bottles or similar you are NEVER allowed to bring into the scanner room! 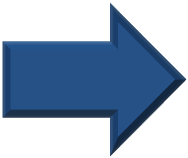 In the course of emergencies or hazards the scanner room and the wider area should be evacuated. The doors to the scanner room should be closed. In this video you can see how an oxygen bottle turns into a dangerous projectile. Access is permitted only for those who hold valid safety instructions for the B.U.F.F. 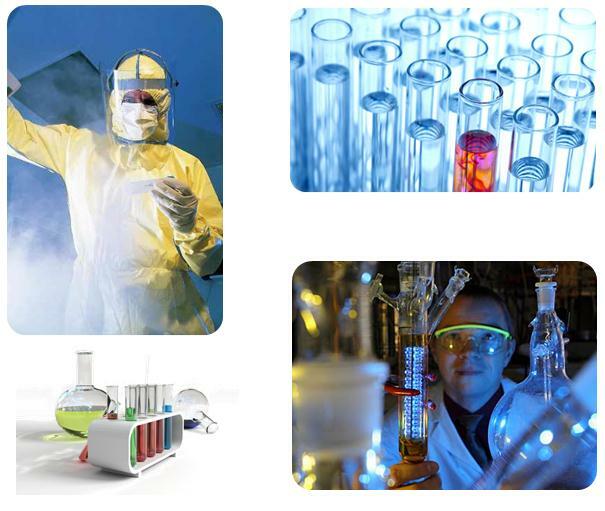 and wear protective clothing consisting of lab coat, gloves, mask and cap! Shoes must be cleaned using the shoe cleaning machine located at the two entrances to the lab area. If shoes are very dirty or wet please additionally use overshoes. Always observe warning and information signs! Safe laboratory work can only be ensured by complying with all warnings, the hygiene plan and by wearing protective clothes. If emergencies do occur, you can find first-aid kits, emergency showers and eye showers in the laboratory or in front of it. Also, the emergency plan with the most important numbers is available in the laboratory.